International departure taxes of $118 plus current fuel surcharges of $300 are included (subject to change). We depart our home airport for our overnight flight arriving the next day. We enjoy in-flight movies, dinner and breakfast aloft. Upon arrival in Barcelona we are met by our guide and transferred to our hotel in the nearby city of Montserrat. The rest of our day is at leisure. Dinner and overnight. We start our day with a visit and tour of the amazing Church of the Holy Family or Sagrada Familia, the still uncompleted masterpiece of Antonio Gaudi. From here, we visit the Cathedral of Barcelona, where we celebrate Mass. Afterwards we move through the Gothic quarter bisected by the famous Ramblas and see the important new developments at the pleasure port where many of the Olympic events were held in 1992. Later, we visit the UNESCO World Heritage “Park Guell” one of Gaudi’s Masterpieces of “landscape architecture.” We return to Montserrat for dinner and overnight at our hotel. Following breakfast, we visit the breathtaking Benedictine Monastery which houses the famed Black Madonna. We celebrate Mass here. Get your cameras ready as we take a drive atop the mountain with stunning views of the monastery, the Pyrenees mountains, and the picturesque countryside below. Following lunch on our own, we make our way to Zaragoza, the capital of Aragon. This city was also the birthplace of Goya, whose works grace many of the sites we visit. Dinner and overnight at our hotel. We tour the city, which was founded by the Romans. The luxuriant vegetation, with its many cascades and grottos, make it a miniature Switzerland in the middle of arid upper Aragon. The number one Marian shrine of Spain, the Pilar Basilica, commemorates apparitions of Our Lady the Pillar of St. James in 40AD. If possible, we celebrate Mass here. In late afternoon, we arrive in Lourdes for dinner at our hotel. In the evening, we join the Torchlight Marian Procession. This day is spent in devotion to Our Lady of Lourdes. We celebrate Mass at the Grotto, with a morning orientation visit to the Shrine and a walking tour of Lourdes, visiting Boly Mill, where St. Bernadette was born, the Cachot, formerly used as a jail, where she lived during the apparitions, and the parish church. This afternoon is free for private devotions, Eucharistic Procession, the Blessing of the Sick or the legendary, healing waters of the miraculous Lourdes spring. Dinner and overnight at our hotel. In the evening, we can once again join the Torchlight Marian Procession. 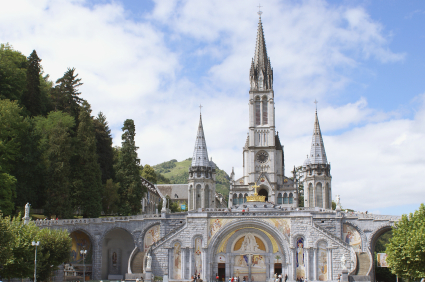 This morning, we leave Lourdes and journey to the birthplace of St. Ignatius of Loyola, founder of the Jesuits. We visit the 17th century Basilica dedicated to Saint Ignatius, his family home and have time to pray at the most venerated room where Ignatius was brought following his serious wounding at the Battle of Pamplona. Following lunch, we venture to Burgos where we visit the magnificent limestone Cathedral of Saint Mary of Burgos. Built in the French Gothic style, you will see a very close resemblance to the cathedrals in Paris. We celebrate Mass here. The remainder of the day is at our leisure. Dinner and overnight at our hotel. Today we travel to Santiago de Compostela, one of the most famous shrines in the western world. This is the site of the ancient pilgrimage to the Shrine of St. James. Tradition holds that the Apostle James was cast ashore here, preaching for seven years leading to the conversion of Spain before returning to the Holy Land. The Cathedral of 11th to 13th century with its splendor, and the portico are masterworks of Romanesque. On arrival this afternoon, we enjoy a visit to the Cathedral and the Old City here. While dinner is included at our hotel, the adventurous might consider enjoying the varied delight of the Galatian restaurants in the nearby Old City. Overnight at our hotel. This morning we leave Compostela and travel South along the Western coast of Portugal to Fatima. Upon arrival we have free time to explore on our own, shop or just relax and take it all in. Dinner and overnight at our hotel. In the evening, we join the International Rosary Procession. 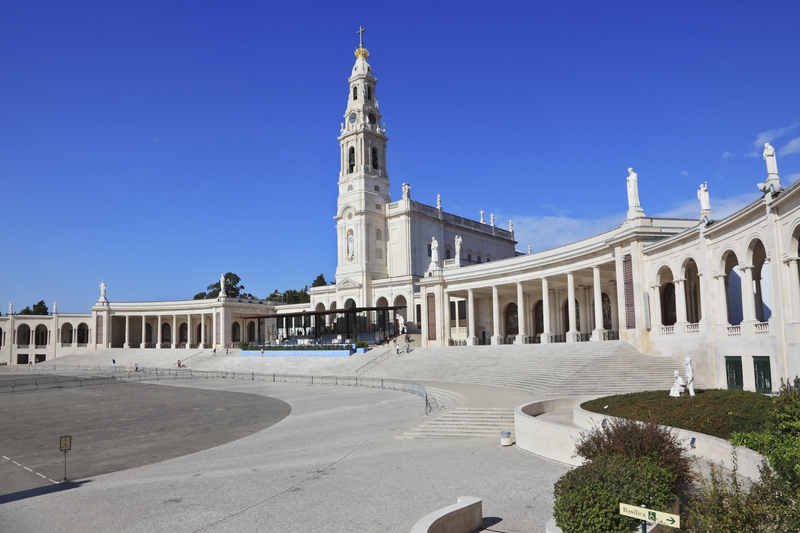 This full day is devoted to visiting the Basilica and Shrine of Our Lady of Fatima and the birthplaces of Francisco, Jacinta and Lucia to whom the Virgin appeared for the first time on May 13th, 1917. In the evening, after dinner, we once again join the International Rosary Procession. Dinner at our hotel. We transfer to the airport in Lisbon for our flight home with unforgettable memories to cherish always.